TacStar 7 Shot Magazine Extension for Benelli Nova. Machined from super-strong chrome moly steel tubing. 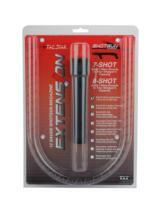 The seven-shot extension allows for two extra rounds includes a new spring. (Note: For 12 gauge only).